To effectively market a product or service there are four things you need to get right: Product, Price, Place and Promotion. These four elements are known as the marketing mix or the 4Ps. The four marketing mix elements should be viewed as one unit and structured to support each other; Otherwise a firm's marketing strategy will be confusing and unco-ordinated. This article provides you with a quick introduction to each marketing mix element and provides links for further marketing mix information. What will be its advantage over competitor products? Or its unique selling point? How does the firm plan to Position the product within the market? The answers to these questions will help a firm design, package and add value to its products. Apple has an excellent marketing mix strategy in particular a very popular product strategy. Their products are carefully built, with well thought out design backed up with their iconic Apple logo. Price is part of the marketing mix because if you get the price wrong you will not sell your product. There are lots of different pricing strategies but every strategy must cover at least your costs unless the price is being used to attract customers to the business (loss leader pricing). A product is only worth as much as people are prepared to pay for it. The amount your target market are prepared to pay for your products/services depends on product features and the target market's budget. You will also need to consider competitor pricing and factors within your marketing environment. Samsung's marketing mix pricing strategy involves them using a number of different pricing strategies for the different types of products they sell. Samsung sell many different types of phones at different prices, this is called product line strategy and it is a very popular way for Samsung and other firms to use their marketing mix. 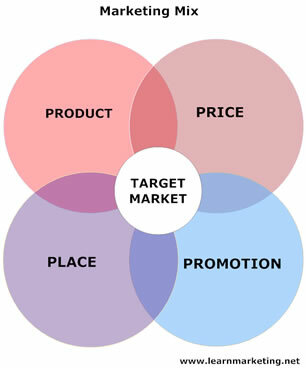 The following link provides further information on place: Marketing Mix and Place Strategies. A successful product or service means nothing unless the benefit of such a service can be communicated clearly to the target market. Promotion is any activity to raise awareness of a product or to encourage customers to purchase a product. Advertising is a form of promotion but not all promotions are advertisements. Retailer Tesco PLC's marketing mix promotional strategy is very varied. They use a combination of above the line advertising supported by campaigns on social media and clever use of YouTube. The following link provides further information on place: Marketing Mix and Promotion Strategies. An increased focus on environmental issues, has contributed to a rise in the demand for environmentally friendly products and services. The spotlight on sustaining the environment has created new terminology such as “carbon footprint” and “offsetting”. Tesla has been a major disruptor within the car industry. The Tesla electric car aims to turn the car industry upside down. Tesla's marketing mix is all about making sure that all their 4p's consider environmental concerns. This has been the main appeal to the Tesla brand. Many organisations have adapted their marketing strategies to capitalise on the consumer appetite for Environmentally Friendly Products. Click on this link to read more about how the marketing mix can be used to market environmentally friendly products and services.